Bernard's interest in violins began in 1991 when his daughter came from school with her first violin. 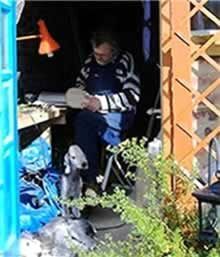 He started making in 2003 and became a professional maker in 2005. Bernard attended a number of violin making courses over the years and would like to thank the tutors at the Juliet Barker summer school in Cambridge and Derek Roberts violin maker for their guidance and encouragement in developing his passion. His research in wood quality, varnish and traditional techniques has led him to believe that some modern methods used in the making of mass-produced instruments can adversely affect the quality of sound produced. "I do not use any machinery in the making of my violins they are entirely made by hand using traditional methods." 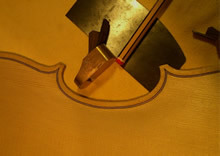 making a Guarneri del Gesù violin. 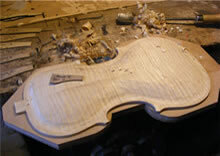 1, Initial carving of a violin "plate". 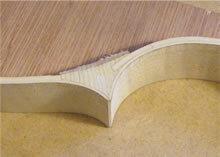 2, Thumb planes are used to smooth out the plate before scraping and tuning. 3, Detail of a corner with the lining secured into the corner block. 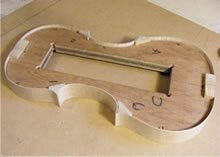 Structural details like this do not form a part of cheaper violins. 4, A mould showing the ribs (usually between 1 and 1.1mm thick on a full sized violin) and blocks still fixed to the mould of a Guarneri del Gesù 1733 violin. Only the best quality European Spruce, Maple and Ebony is used. 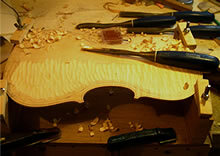 Spruce, Maple and Ebony are the main woods used in violin making. The Spruce tree (epicea) which is used to make the front is taken from altitudes above 1000m as these trees are more likely to receive slow and even growing conditions throughout each year. The best wood is selected and prepared one year before harvesting in the winter. Not all of these trees will be of tonewood quality, the grain should be straight and evenly spaced for optimum strength and response. Right: Preparing the varnish for the first ground coat before the colouring coats are applied. 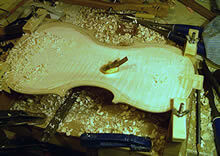 3, The violin has been given initial treatment and a dose of UV light. An application of the ground coat is being applied by hand in the traditional way.